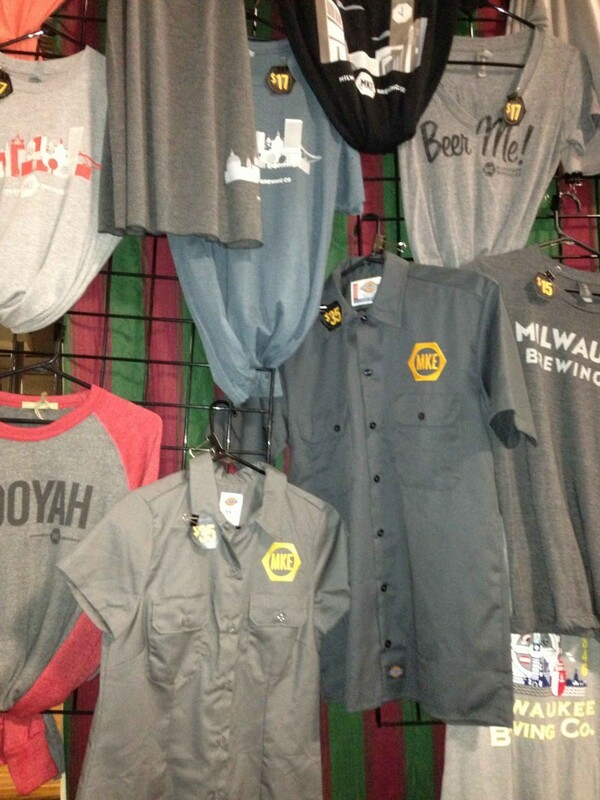 Check out this upstart craft brewery and tour in Milwaukee for a fun afternoon. This group of brewers take their beer making seriously, but endearingly, take themselves very lightly. From the minute you step foot in the doors of the Milwaukee Brewery Company, you’re in for some light-hearted beer loving fun. Their branding is cool with a logo that looks like a hex-nut with the airport code MKE inside. Their uniforms look like they belonged at the airport -maybe circa 1965. Bicycles hanging in the shipping area, discreetly tell you that this is one of those businesses that support and celebrate their employees. The tour starts with a trip to the tasting bar, where you get a full 20 oz glass of beer from a choice of about 10 options on any given day. Then watch a short video that offers a bit the brewery’s background from the brewery owner. Our guide, Tim with the awesome mustache, is probably a stand up comedian when he isn’t giving tours. His love for the company, and its beer, with a strong knowledge of the process offer just the right combination. You come away, after a couple stops back to the bar, with an appreciation of their mission (which seems to be to get you to drink and love their beer) and values (to be known for their environmental practices with the use of bio-diesel and upcoming solar). These environmental practices most recently put them in the limelight for a visit from Gov. Walker (we think he just wanted the free beer, too). Follow the Heritage Drive Scenic Byway to one of the most popular camping areas in the Nicolet located on the shores of crystal-clear Franklin Lake. This 881-acre lake provides excellent swimming, boating, and fishing. Historic stone and log structures and campsites mixed with tall pines and hemlocks are perched near the lake’s edge–a beautiful setting for this campground that is on the National Registers of Historic Places. An interpretive center and naturalist programs are featured throughout the summer. In addition,¬†a one-mile interpretive trailwhich passes Butternut Lake is available for every season. Numerous other trails are nearby, including the¬†Hidden Lakes Trail¬†connecting to¬†Luna-White Deer Campground, as well as¬†a six-mile trail¬†to¬†Anvil Lake Campground. Inside the walls of the History Museum, the past comes alive through the stories, photographs and artifacts of people of the Fox Valley. Our mission is to inspire appreciation for the rich history of the Fox River Valley area communities through the collections, exhibits and education at the History Museum at the Castle. Owned and operated by the Outagamie County Historical Society, the History Museum holds the collections representing the history of the Fox Valley dating back to 1840s. Shawano Lake is a lake situated in Shawano County in northeastern Wisconsin. Shawano Lake is a hard water drainage lake with multiple inlets and one major outlet, the Wolf River. A dam on the Wolf River located in the City of Shawano raises the water levels of Shawano Lake. Shawano Lake is approximately 6,178 acres (25.00¬†km2), with an average depth of approximately 9 feet (2.7¬†m) and a maximum depth of approximately 42 feet (13¬†m). The shoreline length is estimated at 18 miles (29¬†km). The Towns of Westcott, and Washington, and the Village of Cecil border Shawano Lake. The Northwood’s snowmobile club, Dun-Good Riders Inc. is a non profit organization of dedicated individuals, whose constant vigil is to maintain our trails to the best of their abilities. We currently care for 70 miles of snowmobile trails, through some of the most beautiful acres in God’s country. We also watch over 130 miles of year round ATV trail. Our only hope is that you will have a safe and joyful experience every time you visit our trail system. Located in downtown Three Lakes Wisconsin and nestled in the heart of the “North Woods” with easy access to everything the area has to offer. Freshwater lakes, rivers, streams, boating, water sports, fishing, hiking, biking, and leisure activities are minutes from your door.